An old, familiar face takes the lead role in this month's Northlanders. Sven the Returned, the protagonist of the title's first storyline, has laid low and lived the good life in seclusion with his family since the last time we saw him. But such peace was bound to be shattered some day, and in the twenty years since his previous adventure he's become something of a walking, talking myth among the Viking people. So legendary are the tales of his ferocity that young would-be warriors have begun to search for his place of respite. After all, what better way to launch your own reputation than with the head of a genuine folk hero in your hands? Returning alongside Sven is Davide Gianfelice, Northlanders' original artist. Having since moved on to a full-time gig with Vertigo's Greek Street, it's tough to overvalue the importance of his familiarity with both the character and author Brian Wood's vision of the world humanity left behind a thousand years ago. He's well suited for this series, with a knack for getting the most from his panels without overcomplicating them. He shows tremendous restraint, drawing your eye to the subject by emphasizing their stark, desolate surroundings. He calls his audience's attention to more subtle nuances of the scenery; the appearance of a seagull floating lazily through the sky, for example, indicates a sailing ship's sudden proximity to land. And, when it comes to it, he floods the war zone with blood, guts and enough crazy-eyed violence to send a shiver through the heart of even the most hardened veteran. Gianfelice is a perfect accomplice for this kind of work, and it's too bad he can't stick around for a few more issues. Brian Wood's storytelling is one part epic poem, one part standard comic book narration. Its brevity and easy vocabulary ensures that the story will remain an easy read, but its unusual setting and large-format, almost boastful scale give it plenty more substance than your typical comic. Sven clearly hates waiting for these potential assassins to arrive at his doorstep. He'd rather dive right into the heart of the fight and let the violence of the battle sort out who actually deserves such legendary status, but the appeal of spending just one more day at peace with his family is too much to leave behind. Instead, Sven stands lonely vigil at the furthest edge of his land and waits impatiently for the day his quiet isolation will eventually be disturbed by an invading force. He's a complicated character, filled with conflicting impulses, and left to his imagination the perceived incoming threat grows more and more serious with every new day. 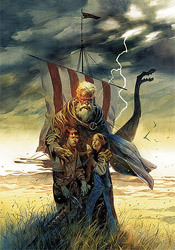 Northlanders has a lot in common with Brian Wood's other, more well-known Vertigo series, DMZ. They're both period pieces, dependent upon the unique identities of the era in which they're set to instigate the action that defines them. Sven and Matty share a thoughtful, uncertain nature that makes them relatable and appealing, and both know more about the world than they'd ever admit to themselves. If you've enjoyed one, you'll no doubt find a place in your pull list for the other, and if you can't enjoy either... well, we don't really have all that much in common. Buy it.